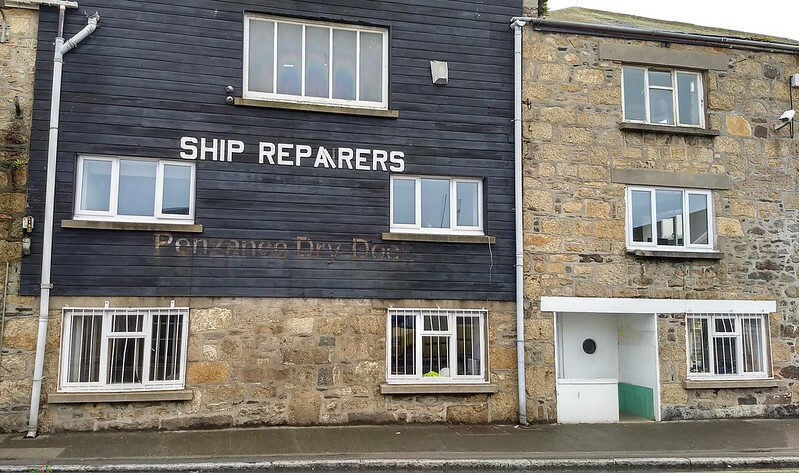 Unlike the budget hotel in Bath, this hotel in Penzance included a full English breakfast, of which we availed ourselves. Very tasty. 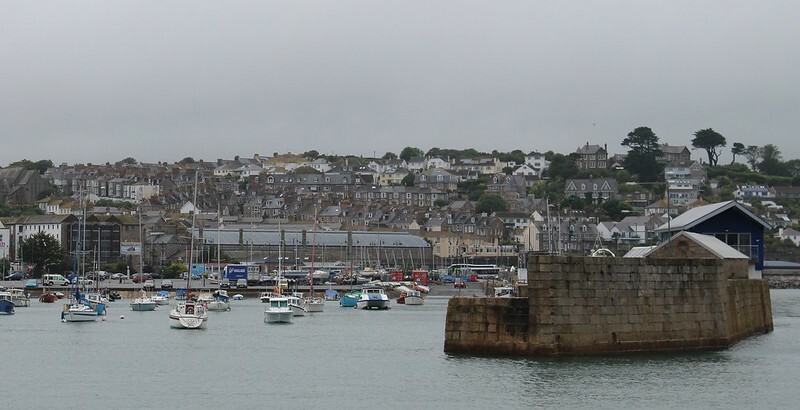 We’d be spending the day in and around Penzance, but leaving in the evening, so we had to check-out. The hotel initially seemed a bit iffy about having the space to keep all our bags for the day. The station doesn’t offer left luggage, but the taxi depot across the street does, at UKP 2 per bag per day. After I’d arranged this, it turned out the hotel manager was in fact happy to mind the bags, but the taxi depot seemed more logical as it was much closer to the station. The taxi depot seems to be linked to the gym next door, and we were instructed to knock there for admittance. Okay, bags dropped, let’s explore. We headed for the bus station. 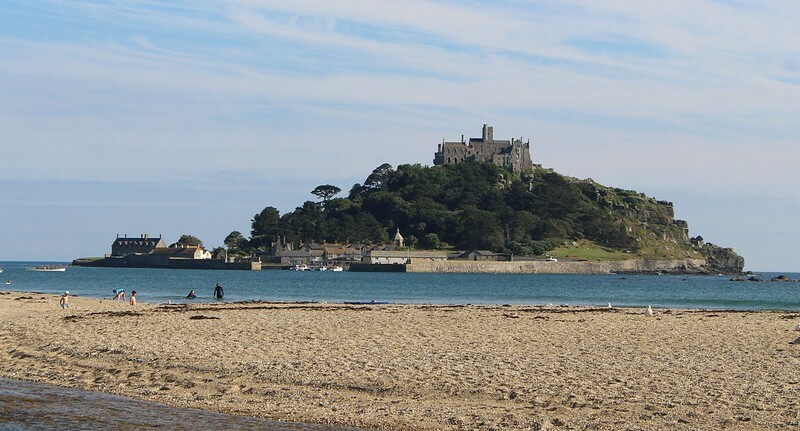 I had in mind two things for the day: St Michael’s Mount, a castle on an island just offshore, and Land’s End, the very western tip of Britain. 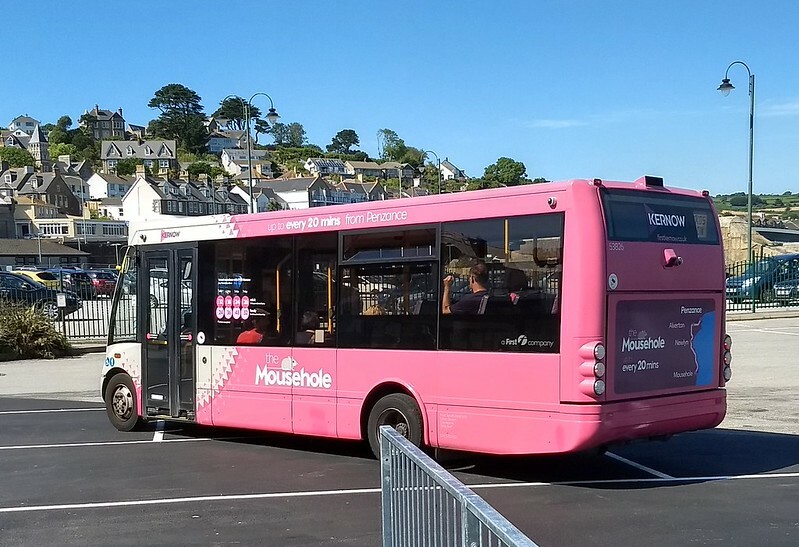 Various other buses depart from the bus station, including one to Mousehole, which apparently isn’t pronounced “Mousehole”, but “mowz ull”. 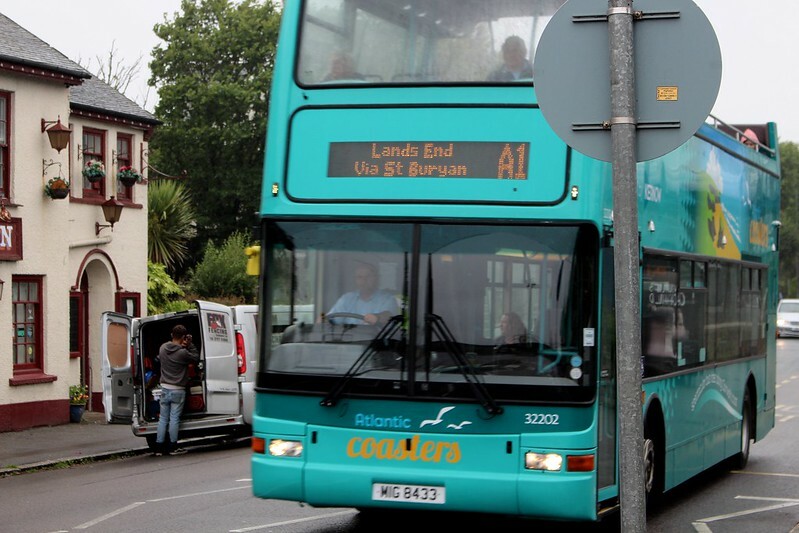 Most of the buses on that route have a mouse logo. The bus to Land’s End was leaving first. 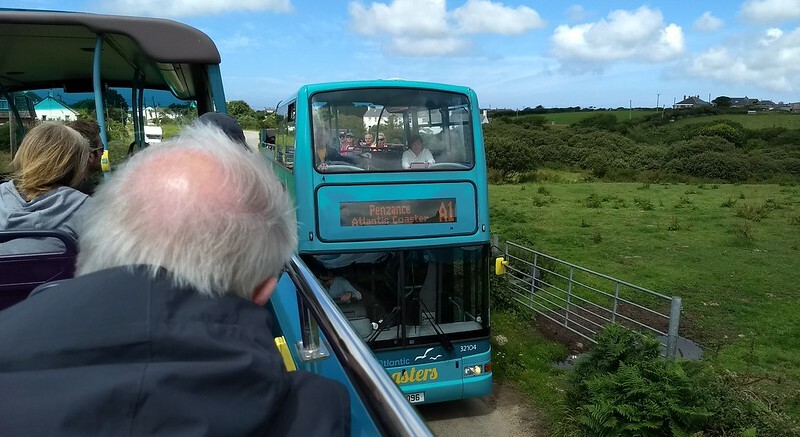 In the tradition of the privatised bus companies with poor online information, the fare bore no resemblance to what was hinted at on their web site, but no matter, this turned out to be possibly the most fun bus ride I’ve ever taken. 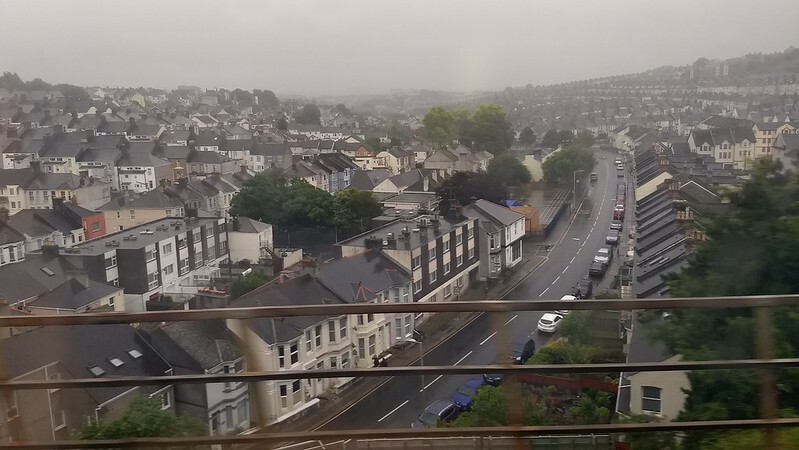 As you leave Penzance, there’s a glorious view out the back window as the road climbs up the hill heading southwest, similar to an old travel poster that I’d bought as a tea towel the day before in a tourist shop. 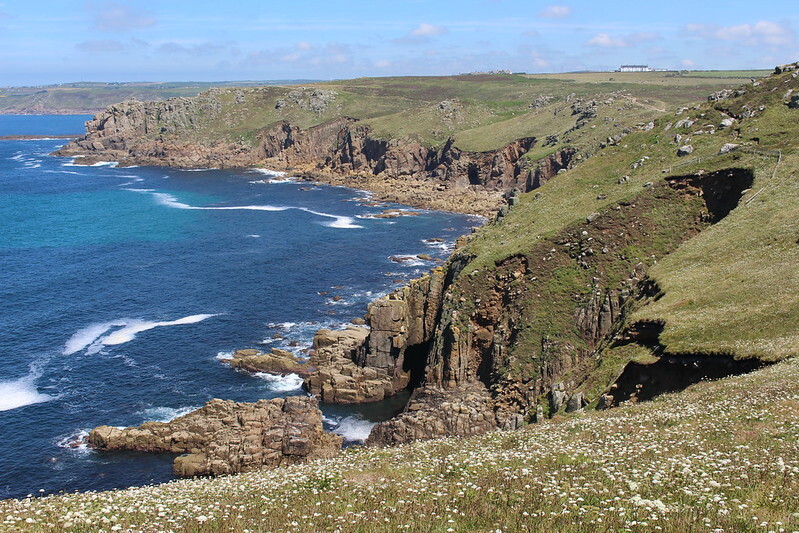 The road from Penzance to Lands End is about 10 miles of mostly narrow lanes. At least, Australians would call them lanes. The Brits call it a B road. It was epic. Many of the passengers sat in the open section of the top deck, watching with amazement as we drove along, each carefully orchestrated dance with the oncoming vehicles seeming more complex than the next. Cars squeezed past us. Trucks had to find a slightly less-narrow section of road to get past. 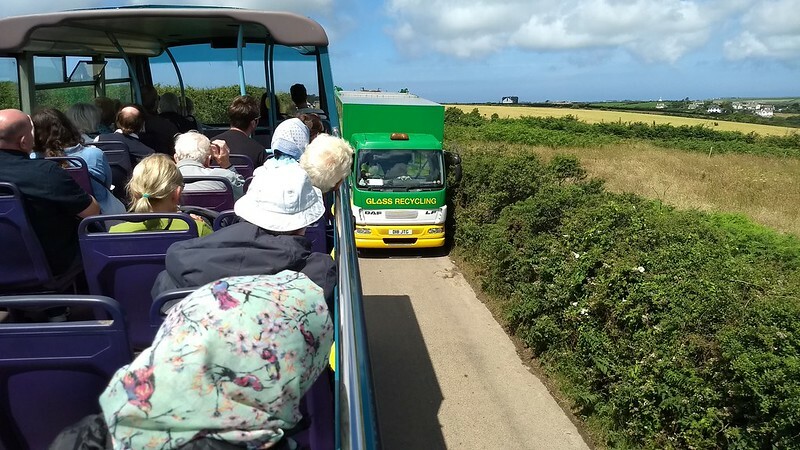 At one point in a super narrow section we came across another bus from the same company – that driver reversed his bus back up the road to find a wider spot where we could pass. Check this short video. I almost edited in a dramatic sting at the 30 second mark. 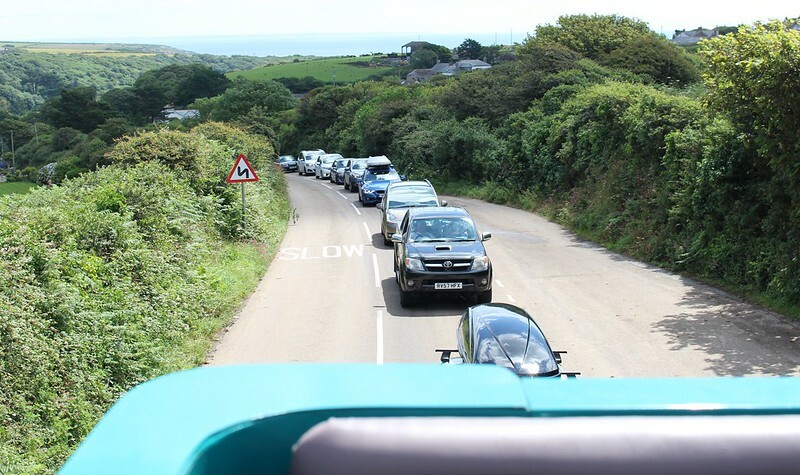 As we drove through villages, many with narrow or nonexistent footpaths, there was also the odd feeling for us on the top deck of rolling past people’s upstairs windows. And I haven’t mentioned the low branches. Some sections of the route had a tree canopy over the road. I’m guessing the local authorities never trim the trees; they just let the buses do the job. 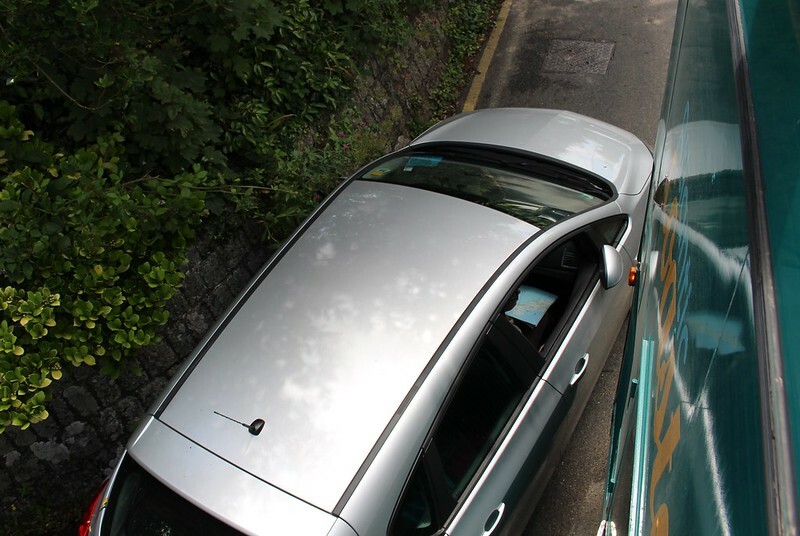 We noticed protective bars on the top front of the bus, designed to deflect the trees away from the front windscreen. Many London double-deckers seemed to have them too. Makes sense. One passenger on the bus brought his dog, whom he said was happy to explore the local buses and trains. The dog sat happily in a seat, taking in the breeze, and would try and snap at low-hanging tree branches as they came past. 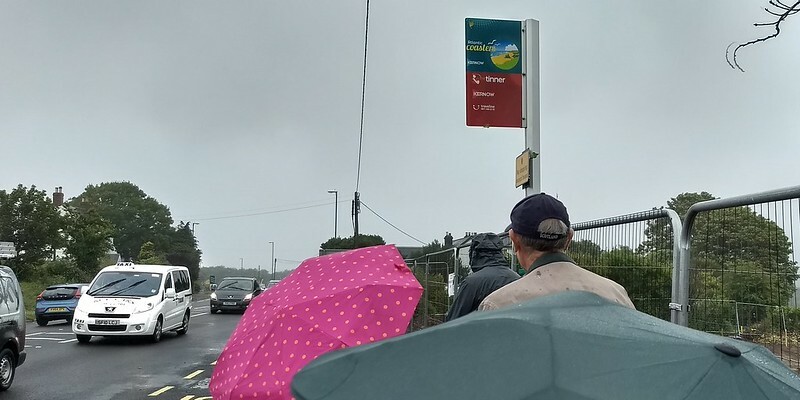 The trip was scheduled to take an hour – I’m not sure what fantasy land the timetablers are living in, as it ended up being closer to 90 minutes. Note for later: the bus back probably wouldn’t be on time. But it was all highly entertaining, and I can’t recommend this bus ride highly enough. 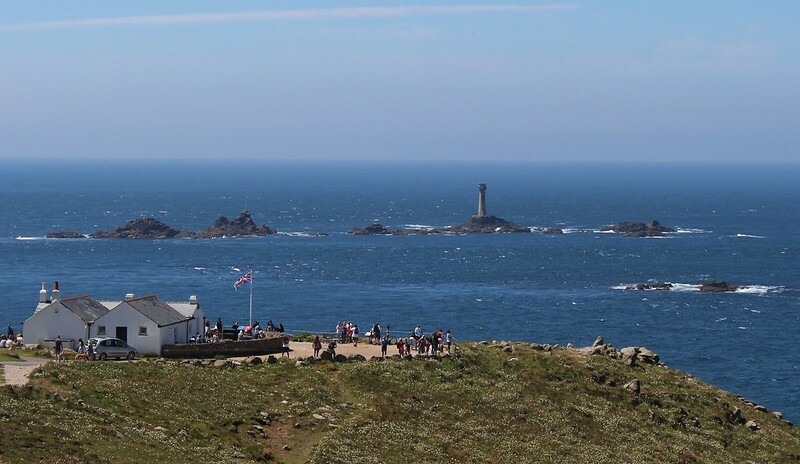 Lands End is the westernmost point of Britain. Unlike the geographically similar Cape Leeuwin in Western Australia, there’s a kind of mini theme park, with restaurants, tourist shops, attractions (Shaun The Sheep was the current resident side show) and so on. 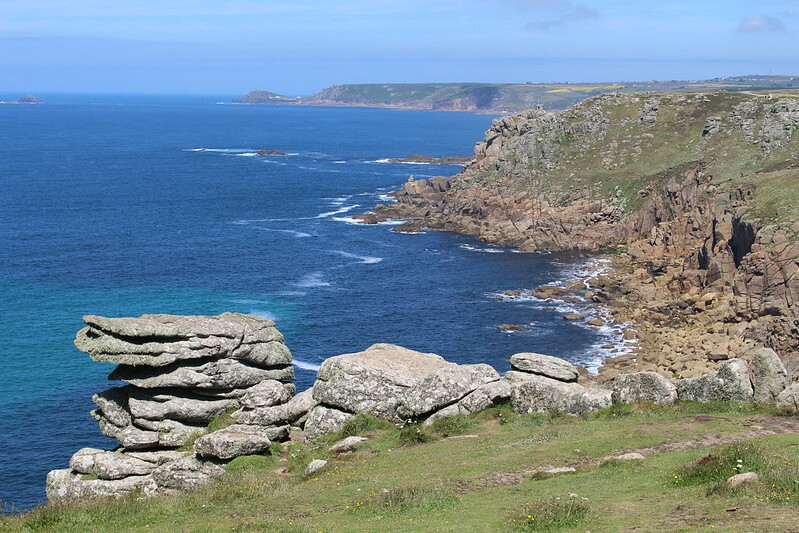 Given it was Cornwall, we decided to have Cornish pasties for lunch, then went to explore. There’s a very nice view off the coast, and we had a look around. Plenty of other tourists around. One bloke and his (possibly long-suffering) partner was lugging a drone around, then getting it to take photos of himself from off the clifftop. 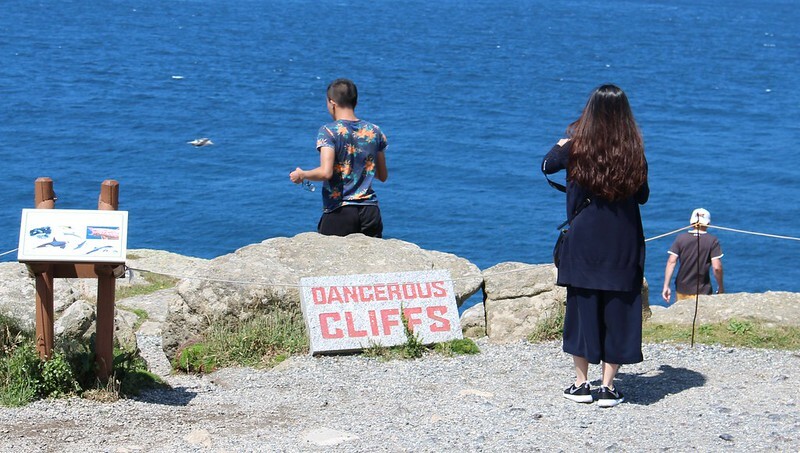 Occasionally some brave soul/Darwin Award nominee would climb over the low fence and gingerly head out among the “Dangerous cliffs” sign to take photos. 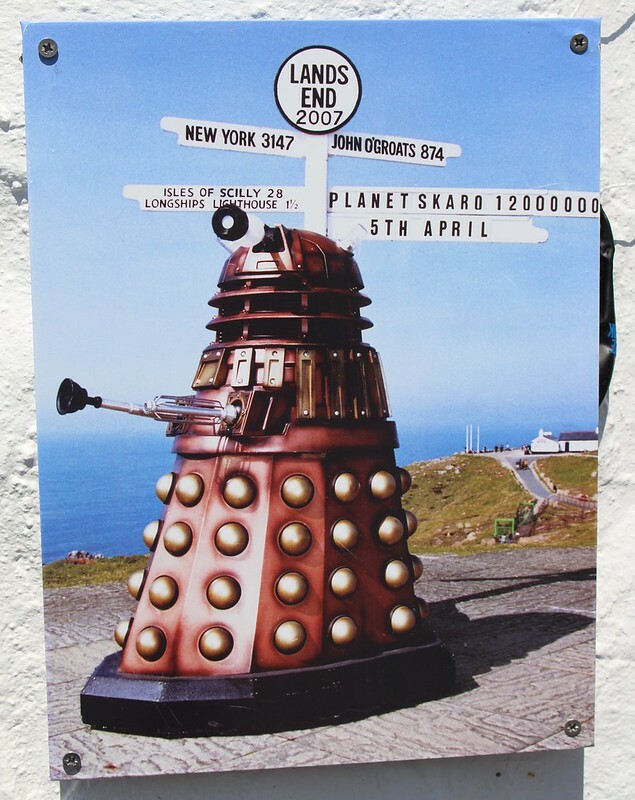 A sign pointing to various locations around the world had a customisable arm on it – for a fee (and if you were willing to wait in the queue) you could add your name, or place of origin, or some other message onto it and have your photo taken. 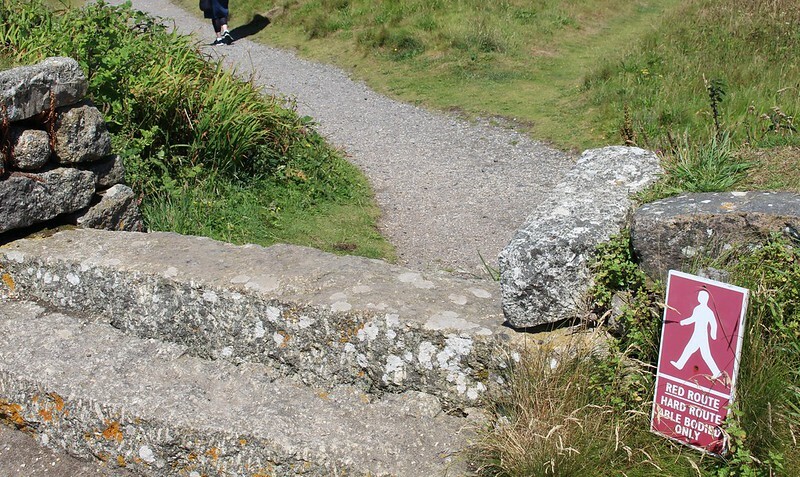 Some of the footpaths around the site were marked as “Red” (for able-bodied walkers) or “Green” (more accessible) routes – though it seemed some of the sealed Green routes were far steeper than the unsealed Red ones. I wonder how people with mobility difficulties actually find them. I was able to set up this comedy pose. One building doubling as a tourist trap shop and ice-cream parlour looked inviting, and it was certainly warm enough for an ice-cream. Then we walked along the coast for a bit to take in some more views. 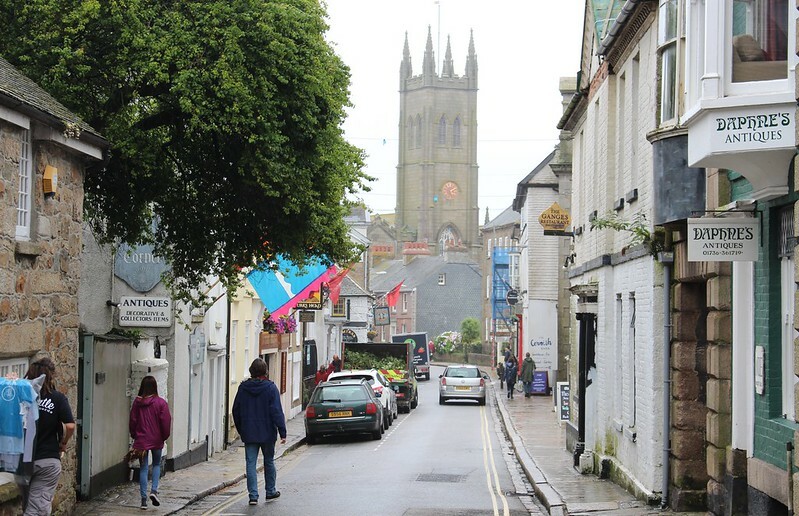 We got back to the bus stop, and it turned up (late) and we headed back to Penzance. Cue more traffic adventures. 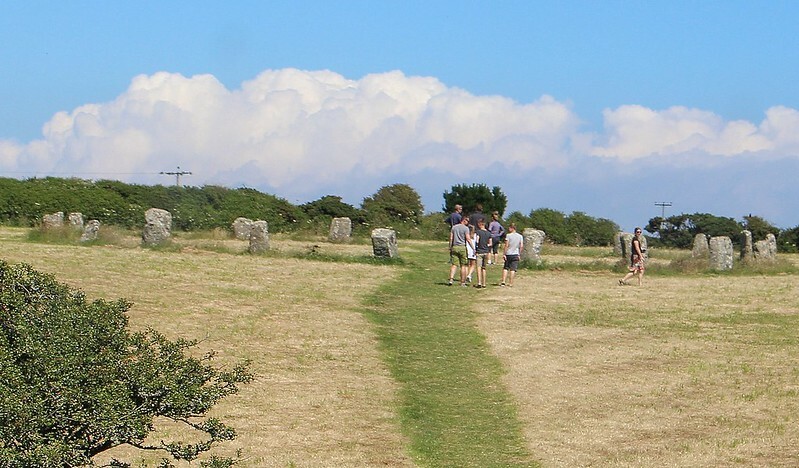 On the way we got a better view of a stone circle I’d spotted along the way — I can’t quite figure out which one it was. 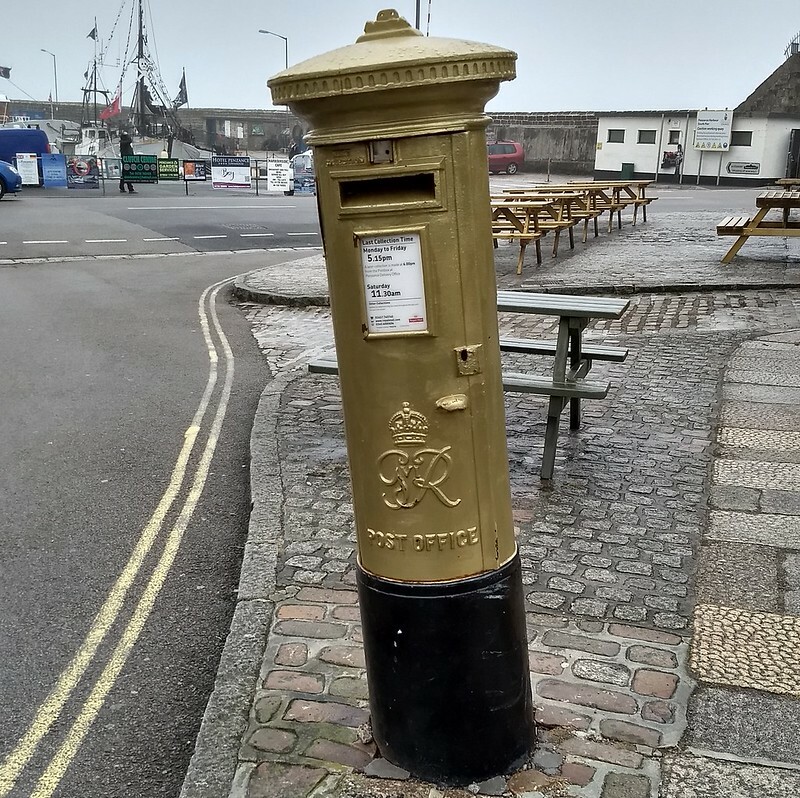 There are no less than 17 around Cornwall, but this was right next to the south side of the road the bus passed along. 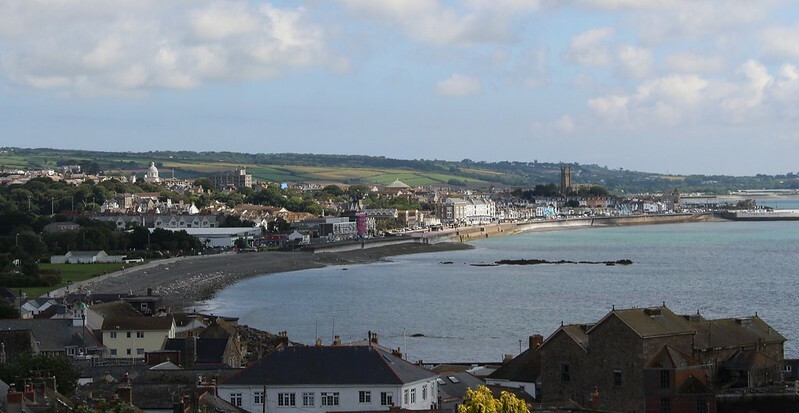 Back in Penzance, we then changed onto a bus to Marazion Beach, further east along the coast from the centre of town. 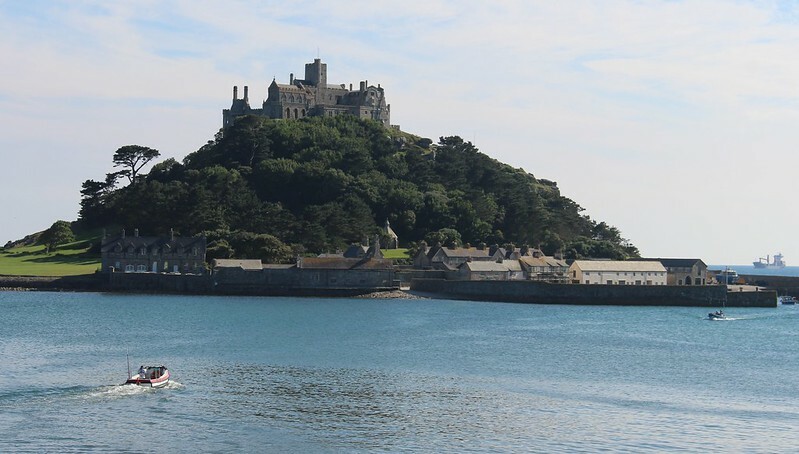 From there you can walk to St Michael’s Mount – a castle on a hill out in the bay – if the tide is out, but it was coming in, so rather than swim, we hopped onto a small motorboat to the castle instead. The boat operator (captain?) let us know the castle would be closing before too long, and rather than rush through, we opted instead to explore the grounds at the base, and have some afternoon tea. It all brought to mind the The Goodies classic episode “Bunfight at the O.K. 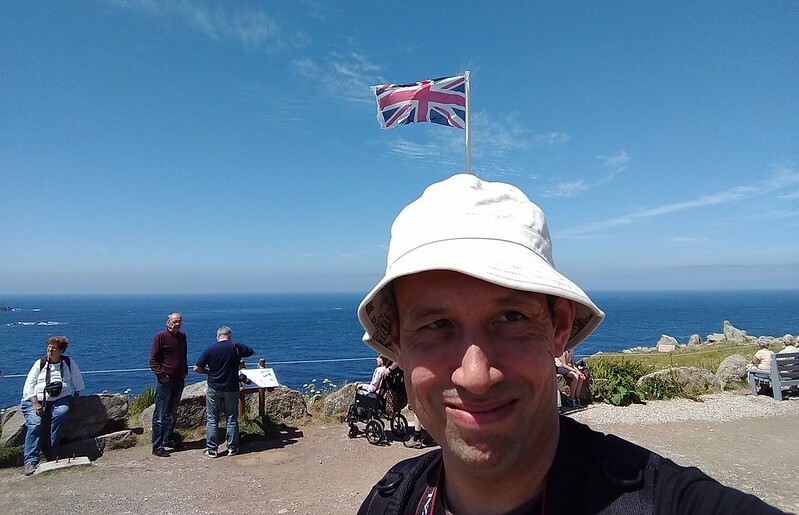 Tea Rooms“, where Graeme suggests they head to the “wild and woolly west” (Cornwall) looking for gold, but find cream, scones and jam instead. 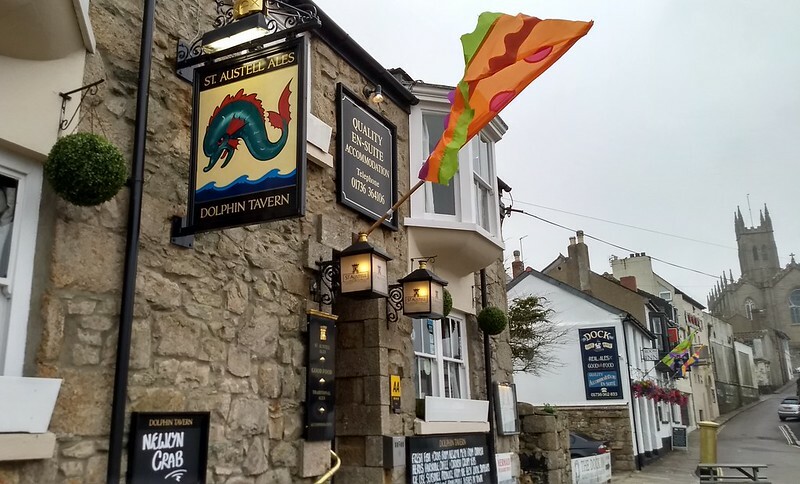 The final scene is a bun fight using various foods, apparently actually filmed in Cornwall, with a great Bill Oddie composition providing the soundtrack. 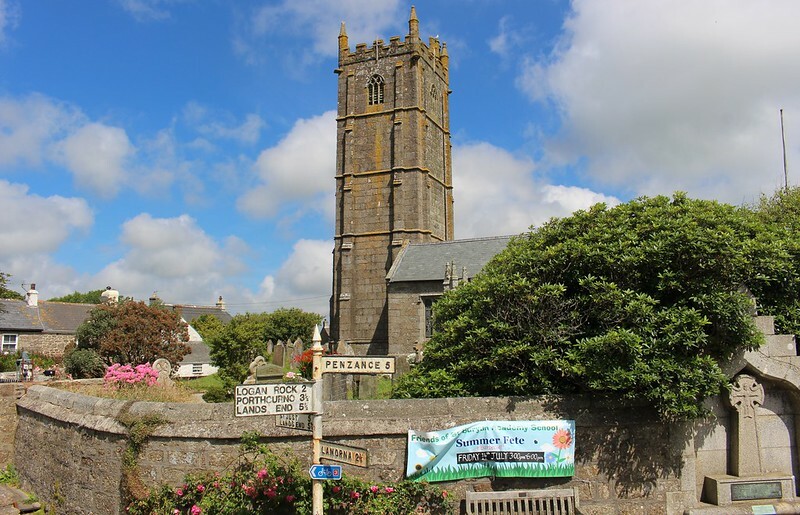 Who had a lust for jam and scones …. scOnes! 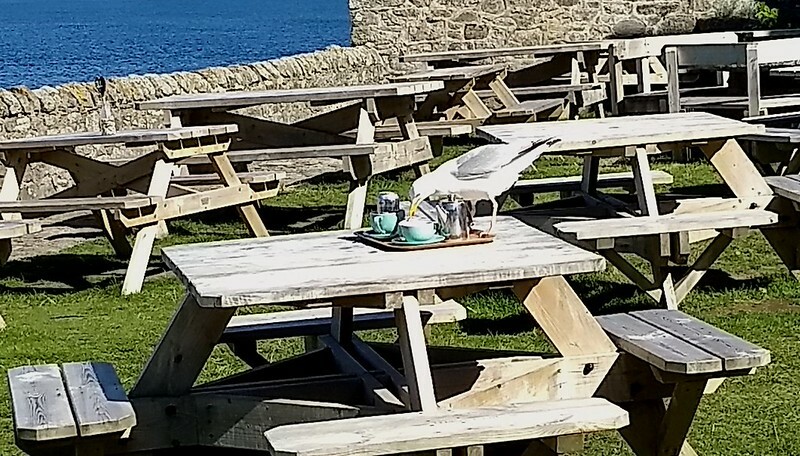 As we enjoyed our tea and scones, jam and clotted cream, we noticed a huge seagull nearby, drinking from others’ leftover milk jugs. A little bit freaky. 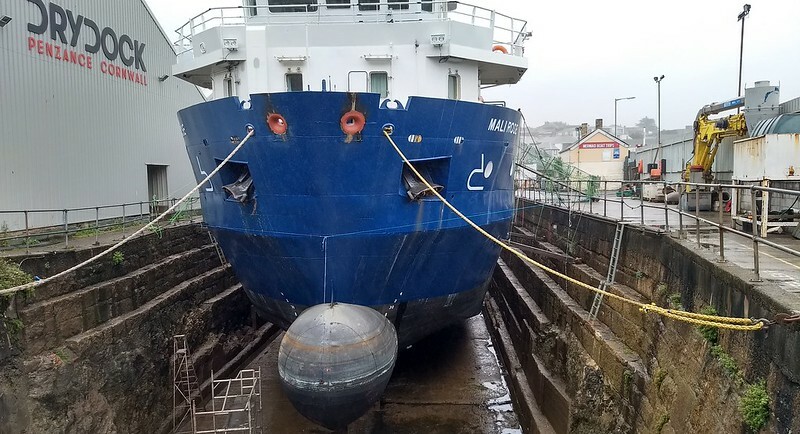 We boarded another motor boat back to land – ending up in a different spot due to the incoming tide. 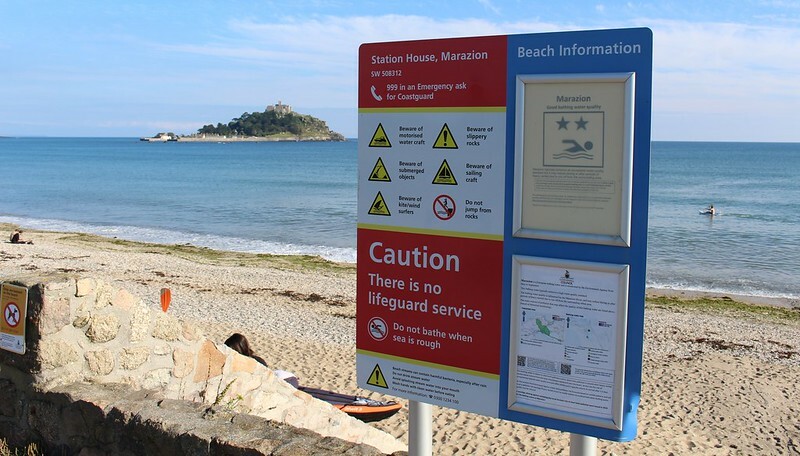 Rather than another bus ride back to Penzance, we decided to walk along the beach. It didn’t seem like too far, though 5 kilometres is actually quite a distance in the heat. Very picturesque though, and good to stretch the legs. 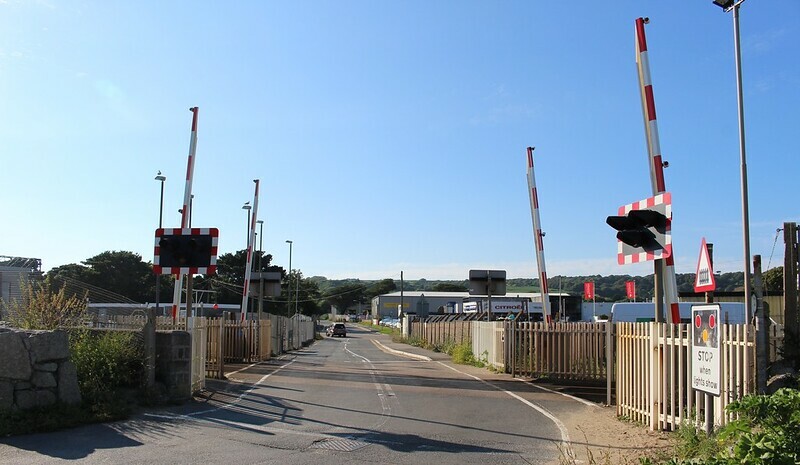 Trainspotters may enjoy the walk, as part of it is parallel to the railway line, including a GWR maintenance depot. 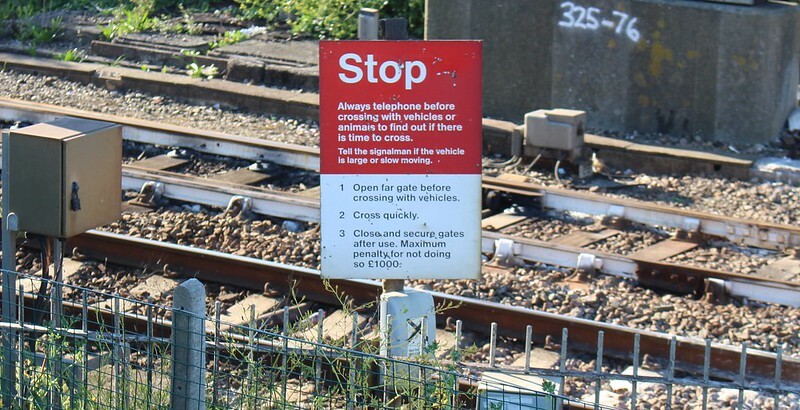 This Railtrack (defunct) sign intrigued me. 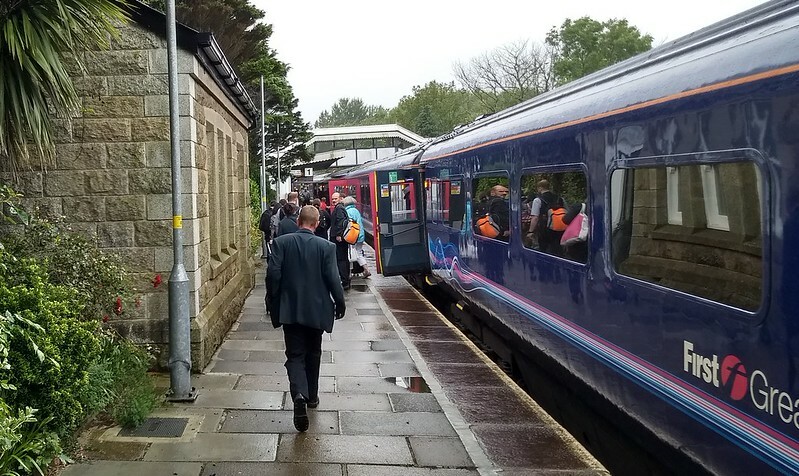 I wonder if it’s a way of saying that eventually the railways might claim back the path? 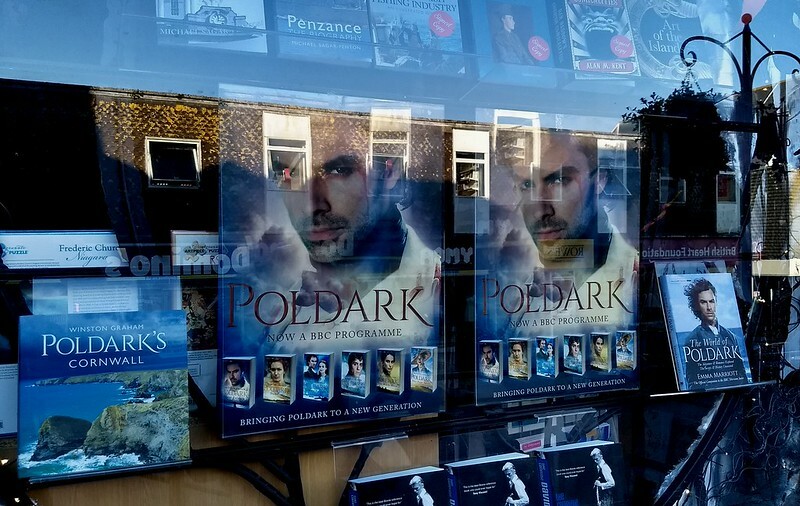 Back in the centre of town, I noticed just how many shops have Poldark-inspired displays and products. Fair enough, might as well milk these things while you can. We started pondering dinner before catching our sleeper train. Pub 1 was very close to the station, so super convenient. But there was a 50-60 min wait on food, they said. I didn’t mind this, but we decided to try elsewhere. At Pub 2 we bought some drinks to cool down, then asked about food. Sorry, they said, they were booked out for food. Booked out? Yep. 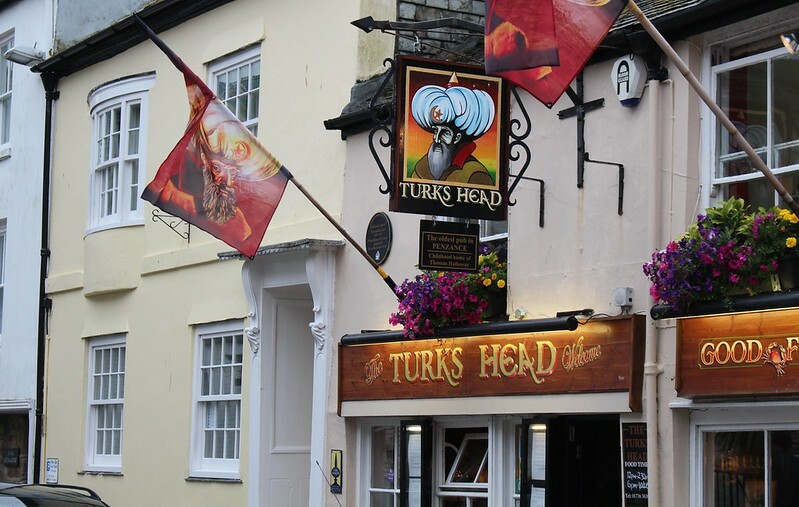 On to Pub 3. Menu looks good. In we went. The kitchen already closed. Out we went. Pub 4. It was now 8pm, and after this impromptu pub crawl, I felt like we were in a hurry, as we needed to be at the station by about 9:30 as the train leaves at 9:45pm. I mentioned that we were in a hurry to the barman, who said there were plenty of seats in the garden and he’d send someone down to take our order, as he couldn’t do it. We read the menus and waited. And waited. I’m sure I wouldn’t be the first to ask if this must be why they call them wait staff… because you have to wait. I went back up to the bar to buy some drinks and asked again if they could send someone to take our orders. Eventually they did indeed take our orders, and we waited some more. Then the waitress came out and said the chef is not entirely happy with the way one of the meals has come out, but they won’t be long. Have I mentioned we’re in a hurry? At this point it becomes clear that we should have just bought our meals at the first pub, wait or no wait. Honestly, I hate being in a rush like this, and my stress was no doubt starting show to my travel companions. When the food eventually came out, I’d actually lost much of my appetite, and I’m sure it was very nice, but I only ate half of it. The others ate their meals, we paid and then we legged it. It was 9:13pm. Fortunately the walk back to the station isn’t too far, but wait! — first we needed to get the bags from the taxi office. We knocked on the door. No answer. Tried the associated gym next door. Nope. FFS. 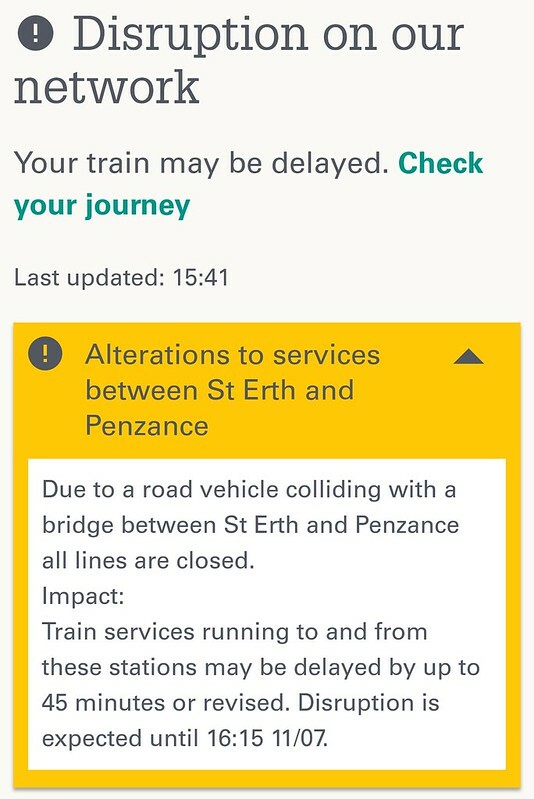 It was now 9:20 and the train was due to depart at 9:45. I found a phone number and rang. See, I told you I need a functioning phone when I’m on holiday. While they were sending someone down, I went over to the station to pick up the train tickets from ticket machine (at least that went smoothly). The bags were released and we went to find our carriage on the train. I was calm again. 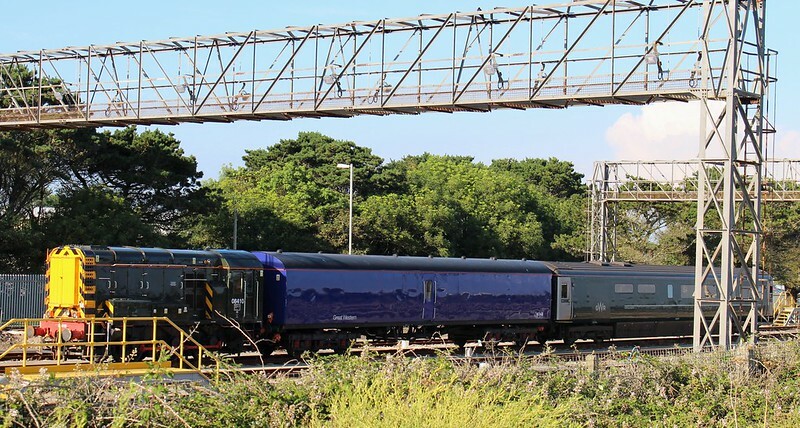 The Night Riviera is one of only two sleeper trains left in Britain. I used the other one, the Caledonian Sleeper, from Inverness to London way back in 1998. It was such good fun that I thought it’d be great to do it again, and drag everyone else along for the ride. To be perfectly honest, this was the main reason we’d come to Penzance: to catch the sleeper train back. 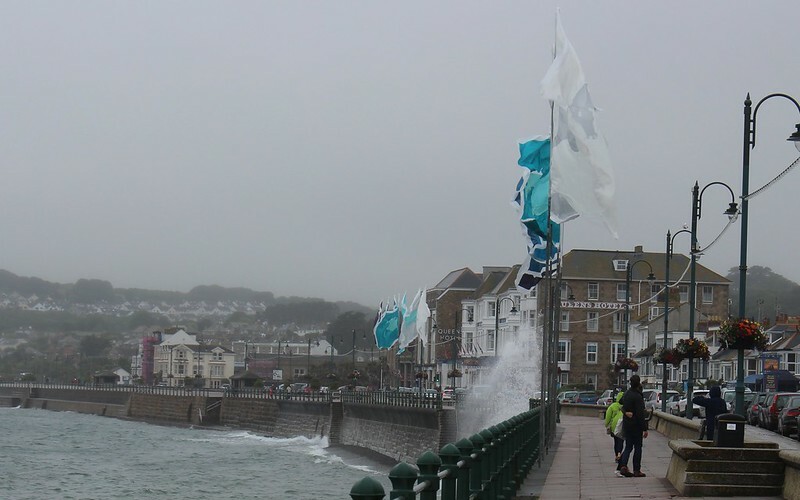 Given that it’s subsidised to encourage tourism to Cornwall, from that point of view, it certainly worked. The conductor greeted us and showed us to our compartments, and explained how the various bits and bobs work. 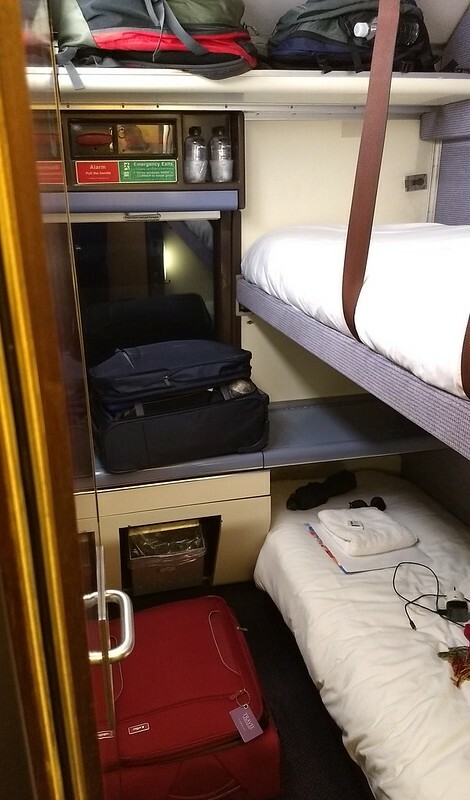 I’d booked two adjacent compartments for the four of us. They’ve got bunk beds, and, it has to be said, not a lot of space for anything else. The toilet was at the end of the carriage (but proved to be nicer than the average British train toilet – Vileroy and Bosch porcelain!) and there was a lounge car elsewhere on the train. We had a choice of breakfast: a croissant, muesli (which the Brits often call Alpen, which confused I+J a bit) or cornflakes. And we could nominate the time for it to be served (doubling as our wake-up call). Given in the morning we had to make a connection to Eurostar, we opted for 5:30am, which is appalling early for a holiday, but oh well. The train was scheduled to arrive in London at 5:23am. You can sleep in later than that, but you have to vacate the train by 7am — after that, presumably they need the platform for peak hour. The conductor noted that the power points in the cabins are really for shavers; for charging phones she recommended trying seats in one of the other carriages. Mind you, from the sounds of it you can actually use the cabin power points for phones if you have the right adaptor. The cabins aren’t very roomy, as you’d expect. Perhaps a little cramped for two people, and I wondered if I should have paid the extra and booked a cabin for each person (they have connecting doors so they can be paired up), but my travelling companions didn’t seem to mind – it was something new and different, after all. The fares for the four of us? £168.20 (£42.05 each with various discounts including GroupSave) for the trip itself, plus £180 (£45 each) sleeper supplements for the twin-share cabins. If we’d wanted a full cabin each, it the supplement would have been another £100 – a total of £280 (£70 each). Maybe next time. 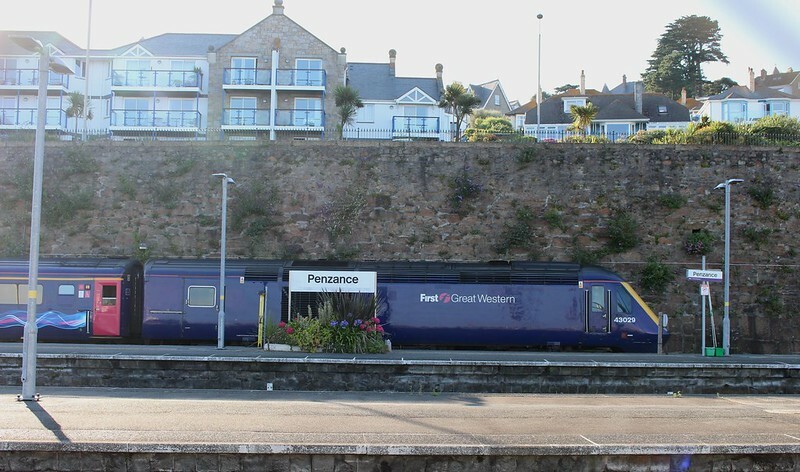 The train rolled out of Penzance on-time at 9:45pm. 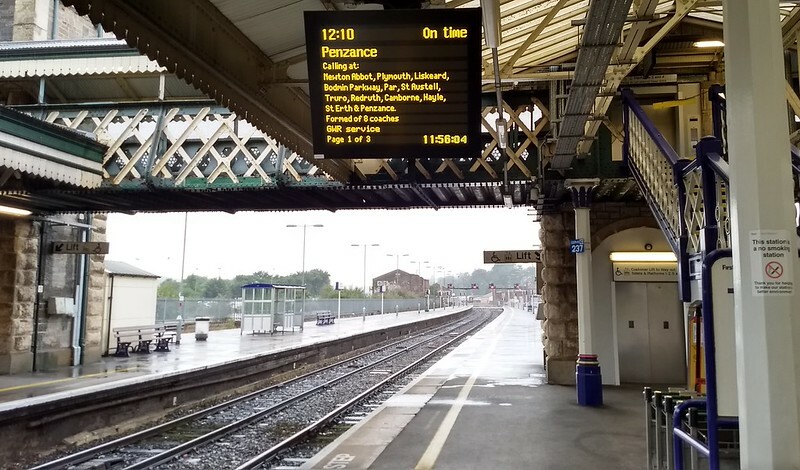 Normally by train it’s about 6 hours to London; the fact that it takes 7.5 on the sleeper train probably means they either run slowly, or perhaps they park it somewhere along the way. 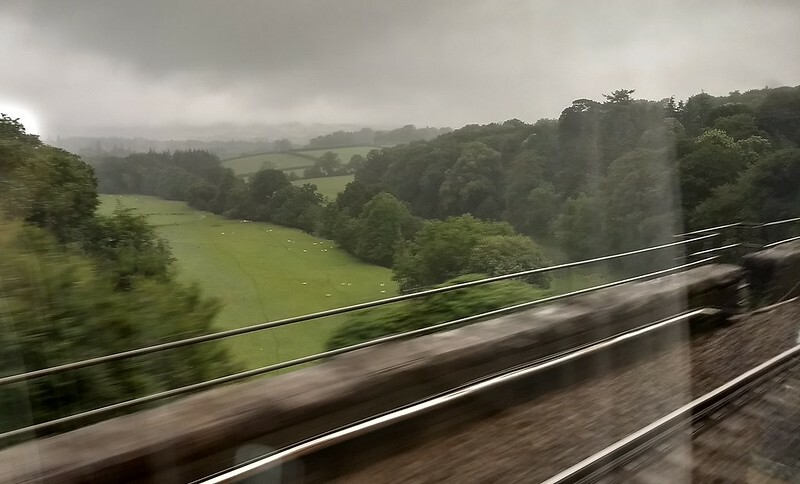 I spent some time in a seat elsewhere in the train charging my phone enough to get us to Brussels the next day, catching up with the world via WiFi, and watching the darkening scenery of Cornwall passing by. The seats in that carriage started to fill up as we made stops along the way. Then I headed back to the cabin and drifted off to sleep.